Luis Leloir was born in France but raised in Argentina, educated at the University of Buenos Aires, and studied under Frederick Hopkins at Cambridge and Carl and Gerty Cori at Washington University in St. Louis. With Bernardo Houssay, he began planning the Campomar Institute of Research in Biochemistry in Buenos Aires in 1945, and after the facility opened in 1947 he served as its director for decades. In 1957 he discovered a new coenzyme, uridine triphosphate (UTP), which led to a new mechanism for synthesizing glycogen, and brought Leloir the Nobel Prize for chemistry in 1970. 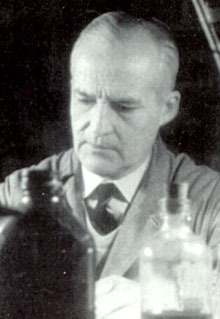 He rarely drove and almost invariably wore gray overalls to work at the Campomar Institute, which was renamed the Leloir Institute after his death in 1987.